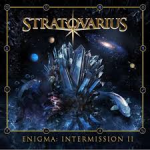 Share the post "Quick plays: STRATOVARIUS, NINE DART FINISH"
In between studio albums Stratovarius give their fans a second ‘Intermission’ album and like the previous ‘Intermission’ released some 17 years ago, ‘Engima’ features three new songs, four orchestral re-workings of older songs and twelve rarities that have either been only on European releases or first time on a CD. So for fans it is a decent enough collection of new and rarer songs to make it worthwhile buying. Of the three new songs ‘Oblivion’ is a classic Stratovarius tune complete with layered keyboards and a tasty guitar solo. The orchestral versions work well for the most part, although at times they seem to borrow that electronic beat from the ‘Hooked On Classics’ albums of the early 80′s! They lack the depth and bombast of the orchestral/symphonic metal other bands do. 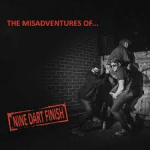 “The Misadventures of..” is the debut album from Birmingham based band Nine Dart Finish, a mixture of Brit pop influences and more raw edged rock, the album is a mixed bag really. Opening track “The Cut Of Your Jib” is repetitive, simple and effective, this is followed by the Brit pop meets the Arctic Monkeys like “Fall To Pieces” and the Stooges like guitars of “In The City”. So far, so good, slower to start with the recent single “Kicking and Screaming” is another good song, “Falling For You” is another more guitar dominant song and the highlights are rounded off by “You’re So Cool”. The album bows out with the punk tinged “London” and for me this is indicative of the issue here. At least half of “The Misadventure of…” is more Britpop orientated and when the band are in this vein they are just another band having ago, but, when they are playing the songs with the choruses and the dirty guitars they really do have something. This entry was posted in ALBUM REVIEWS, ALBUM REVIEWS (Mobile), All Posts, Quick Plays and tagged albums, Brit Pop, Enigma, Intermission 2, melodic metal, Nine Dart Finish, pop rock, power metal, review, Sratovarius. Bookmark the permalink.